Wn24 Luc-sur-Mer, K.V.U.Gr Riva-Bella, K.V.Gr Caen. A small defence along a low cliff top, very little remains but if you look carefully I am sure you will find something. Nr1694 without hood for 5cm KwK..
Nr1694 with hood for 5cm KwK..
Nr1694 with 5cm KwK L/60. 9. Kp (Hauptmann Kurt Mickish 3 Bn. 736 Inf Major Pipor. 2 x Ringstands for 5cm KwK Pak Nr1694 type one with a hood..
Vf69 for an 8.14cm Gr.W278(f) mortar. 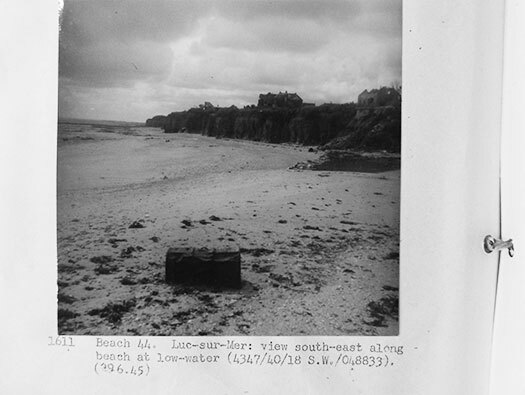 The beach and cliffs of Luc-sur-Mer and Wn24, quite impossible to use as a landing beach. The eastern end of the Wn. 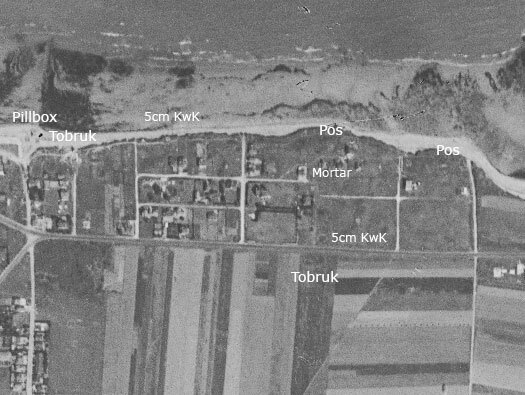 The 1947 air-photo shows how empty the area was. The roads had been laid out and a few large houses built. 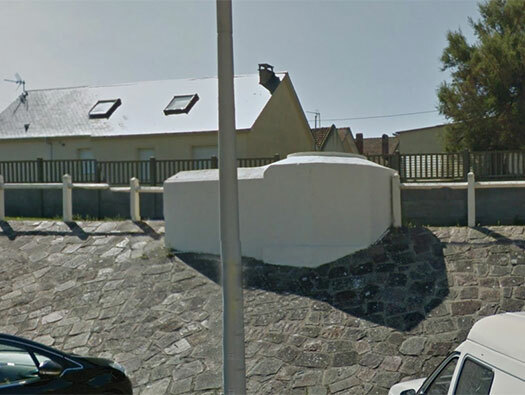 The defence was a trench system running the whole length of the small cliff with a Vf8 two man Tobruk, then an Nr1694 ringstand for a 5cm KwK L/60 Pak gun with 360° view. 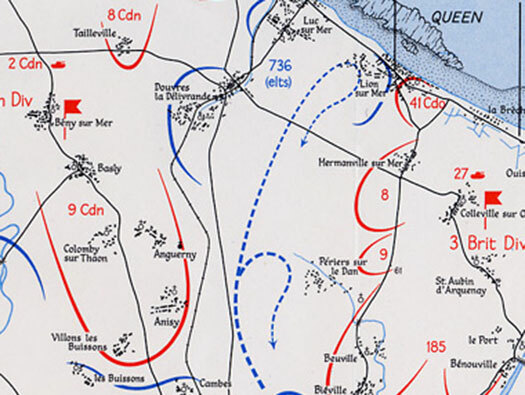 The trench continued to possibly two Tobruk's and then about four or five entrenched positions. Inland another 5cm KwK but this time in a ringstand defended with a small roof/hood. Also an 8.14cm Gr.W278(f) French mortar in a Vf69 ringstand with a mortar Tobruk and a machine gun Tobruk for spotting and defence. Another heavy Tobruk an Ic116 with two men covering the rear. The Wn was surrounded by a barbed wire fence and minefields. 5cm KwK L/60 Nr1694 with a hood. Just along the front is the Vf8 Tobruk. 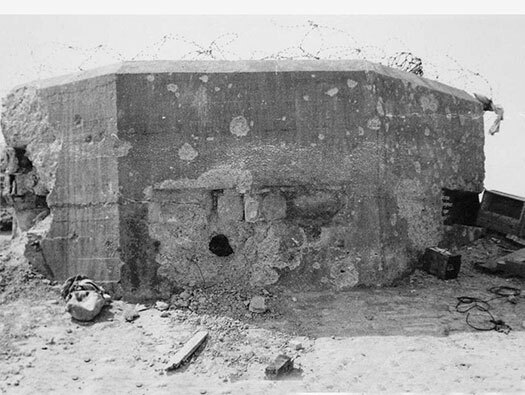 A bunker very like this may have sat opposite the Vf8 Tobruk. 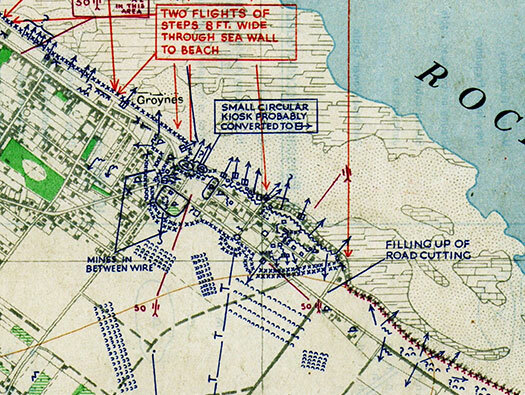 Bigot map showing the defences just prior to D-Day in incredible detail. D-Day fire support onto Wn24 was entrusted to the destroyers HMS Eglinton and HMS Kelven. D-Day fire naval fire support. Plan of the German fire control map for this area. 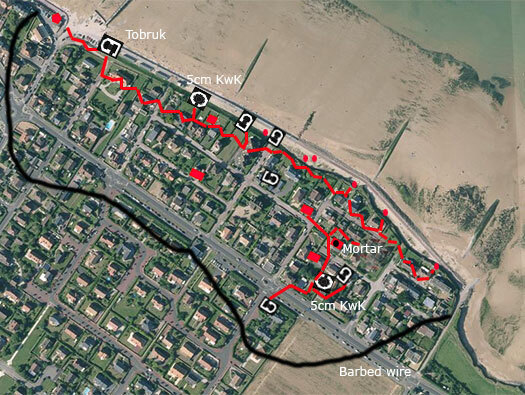 A call on the field telephone or radio with the code word 'Hanover' would draw down fire onto the beach area of Luc. 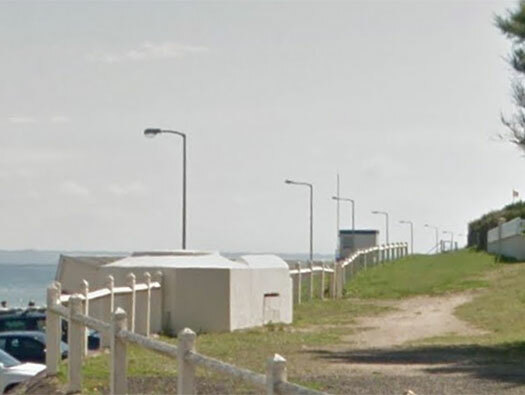 This area was not attacked from the sea on D-Day. 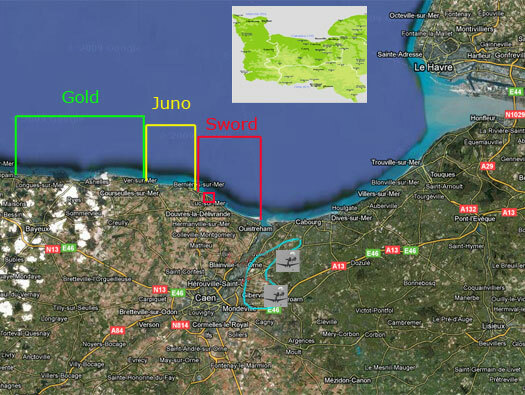 The main Sword Beach landings happened to its right. At 16:00 German Panzer's advanced to the sea at Luc-sur-Mer and at 21:00 a very large fleet of bombers towing gliders flew over their heads with fighter cover in 'Operation Mallard,' with 226 Horsa and twenty Hamilcar gliders. They were loaded with men, ammunition and light tanks. The Panzer's turned and went back thinking they were about to be attacked in the rear by this large glider force. [East of Luc sur Mer, six Panzer IV and a company of Panzergrenadieren of 21. PZ. Div. reach shore at the nightfall. 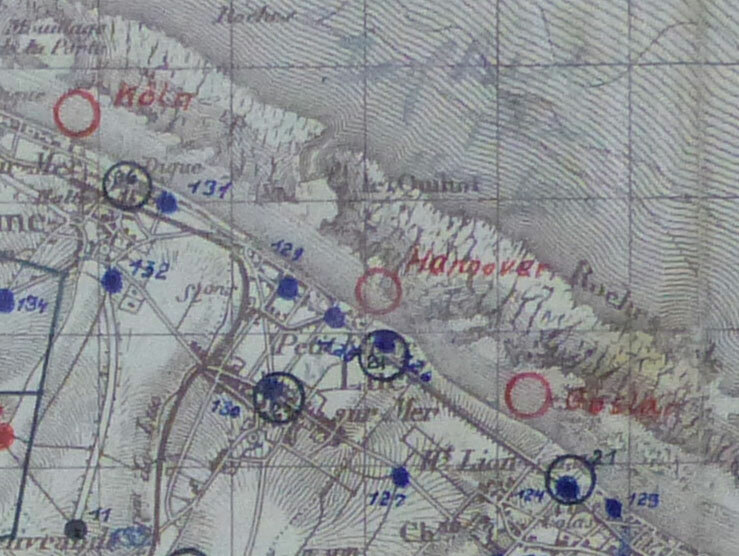 However, expecting a British counter-attack and having noted the very low motivation of their compatriots holed up at Luc, the Germans retreated in turn.] translation. Above the beach with gliders and tugs flying in. 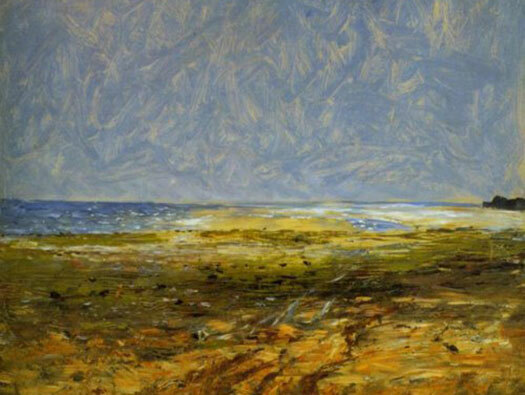 Jeep and trailer leaving the DZ..
Carl Fredrik Hill Beach at Luc-sur-Mer 1876 Goteborgs Konstmuseum Gothenburg.